For me there’s joy in singing and the members of my chorus, experience joy singing as one voice. We have such fun playing with each word, note, chord and line of the songs we sing and sometimes we sing a line over and over again until we get it, well, perfect. As peacemakers and peacekeepers (not homemakers and housekeepers) when we can find joy in the mundane, we have mastered life. Much of our time is taken up in the repetitive necessities of life, like cleaning, cooking, organizing; the basic stuff of routines. If we can come to a place where we are actually thrilled to take care of the everyday responsibilities, we’ll not only up our joy quotient, but that of our family too. Humor is so essential. In my chorus, our director has a wonderful sense of humor and our chorus reflects his humorous lead. In the link (below) to a performance by my chorus, you’ll see the humor that makes you want to come and join us. When parents have a healthy sense of humor, the stresses of everyday life are diminished. Laughter is like a spiritual milkshake and I believe a family that laughs together lives a spiritual life whether they attend a church, temple or mosque. In my chorus, we experience unity. Without cooperation we can’t create a wall of sound that wafts over our audiences and relays our intention of love and joy of the music. There is absolutely no coincidence we are with the family we are with. When we “get” that, we can create a home life that’s heaven on earth. When parents create a united front when raising children, the children thrive. When siblings cooperate, the family unit thrives. Every song has a special rhythm and each day in our homes there is also a special rhythm. Sunday feels different than Monday or Friday. When we have a plan for each day we can get into a rhythm that gives our family a place to thrive. Trust is a crucial element in any group. It involves trusting each other so that the group as a whole can be better than the members can be individually. (I've had a chance to hear each voice individually in my chorus and individually we really aren't that great. But together we are 4th in the world out of 648 choruses!) We have to trust that each singer is singing exactly what the “plan” is. Each of the four parts has to trust the other three, for if just one person sings off key or is out of sync, it throws the whole chorus off. As members of a family, we’re more than what we would be individually when we trust each other. We fit into a unit that creates wholeness that we could not experience if we were not together. It involves trust of each other’s parts. Performance is all about how we live. David Brudnov said, “Life is not a rehearsal.” When we rehearse we have to appear on the risers in what our director calls, “performance” mode. In other words we don’t get to have an attitude of rehearsing, but we have to act as if it is a real performance all the time. As peacemakers and peacekeepers, we are the absolute setters of the “climate” of our homes and when we are in “performance” mode with our families, we have all of our energies and awareness focused on the yummy challenge of running a home in harmony. When we put forth an attitude of love, joy, unity, humor, rhythm and trust, and we do that in performance mode, we automatically create harmony in our homes which produces happy families. Let’s perform our role as peacemakers and use our love, joy, unity, humor, rhythm and trust to create happier families. Clutter is a real joy crusher. There’s no joy in rummaging through piles of stuff to find your car keys, or stepping on Legos in bare feet because the family room floor is covered with toys. 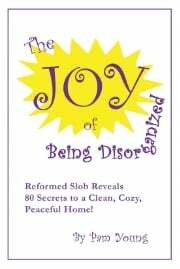 My latest book, The Joy of Being Disorganized, has a chapter that will help you see your clutter in a new way. You’ll be inspired and motivated to get rid of 80% of your stuff. I feel it’s so important, I’d like to give you the chapter, There Arose Such a Clutter.